This race was a little bit different to all the others Phil had done over the past few months. As Phil had only signed up for the race 4 weeks before it took place, he was unsure as to how he would perform – with no specific Marathon training in the locker. With this being The British Masters Championships, I felt I wanted to at least have a go at the Marathon distance. After my victory in The British Masters Half Marathon Championships for my age group, the idea of being a double British Champion was too tempting to resist. Despite the lack of Marathon training, I have still put in a lot of miles, and hoped that this would be enough to get me through and put in a decent performance. 10 days before the race I did a 20 mile training run, which was the longest run I had done in some time, and it went exactly to plan, provided a much needed boost to my confidence and removed some of the doubts I had. On race day I felt good and quietly confident that I could run a PB as a minimum, with my 2nd aim being to at least get a medal in the British Masters Race. The course was 5 laps, which was something I hadn’t experienced before, and I decided to go out pretty hard, so I would be at the front of my age group, and then would be able to tell if anyone came past me and race accordingly. After the 1st lap, I had executed my plan exactly as I had intended; I was sitting in 5th place, having gone through the first 5 miles in under 30 minutes, and was feeling pretty good. 8 miles in and I moved up in to 4th place and was still feeling pretty strong, but very conscious I hadn’t done much over ½ Marathon distance in the previous few months. The 2nd and 3rd lap came and went and I was still feeling good; I knew I was well on course to smash my PB for the distance and, more importantly, was in 1st place in the British Masters for my age group. During the 4th lap, I really began to feel the miles in my legs, but at 19 miles, where part of the course goes back on itself, I was able to tell that I had opened up nearly a half mile lead on the person behind me and knew it was safe to ease off slightly for the last lap to save my legs. I did this, but with 2 miles to go, despite easing off, I had still managed to make up the time on the person in 3rd place overall, who gradually came closer and closer to me; I could tell that I was feeling stronger than he was. We approached the hill that sat 3 miles into the loop and I sat on his shoulder as we went up it. As soon as I reached the turn to go back down the hill, I made my move and accelerated past him. 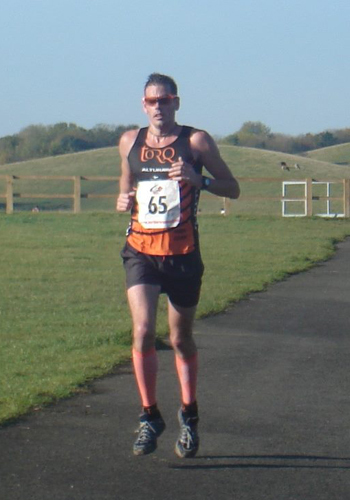 I still had some strength left in my legs after easing off for the last 3 or 4 miles and accelerated to put some distance between us and, by the time I got to the 26 mile marker, I knew I had secured 3rd place overall and the British Masters Championship for the 35+ category. Looking back the race really couldn’t have gone any better for me and I ended up hitting all of my goals, running an 8 minute PB, securing a Podium finish and becoming British Champion in my age group for the 2nd time this year. After a couple of races the previous month, where I hadn’t done as well as I had wanted, this felt like I was back to my strongest and, I’m sure with a focused Marathon training schedule over the Winter, that I’ll be able to run another PB at London in April.